Like what you see? please share this site and let friends know about our great offers! We aim to stay with you for the long-term not just the short-term. Champion Print is a London based company made up of friendly printers who have over 25 years of hands-on printing knowledge and experience. With regular work from clients including: Topman, The Conservative party, Superdrug, Leeds University, and Kreate Promotions we are not afraid of a challenge. We offer great printing solutions whatever your needs may be at great prices other print companies find hard to beat. We equally make sure of a fast turn-around to meet your deadlines... essential for any successful and growing business of today. We are dedicated to every job however big or small. Most Screen Printing is produced by automated print machines ensuring accuracy and a quality long-lasting professional product. If you are brand marketing or launching new products, t-shirts and merchandise are a great way of getting your message across. Whatever the size of your company, we can offer you an affordable quality approach to printing t-shirts and garments to your needs. No matter what you may need for work, a club, charity or band whether you need overalls or high-vis vests with your logo on to t-shirts, hoodies, and caps. We have direct links to many clothing and textile manufacturers and we can source and print exactly to your requirements. If you want to be experimental or sample and learn new print techniques we can assess your needs and give you time with one of our printers to get your prints right and how you may envisage them. We love experimenting and trying out new ideas, and with a wealth of knowledge and having done the same with other designers, we will offer you great advice, suggestions and ideas. Having a stag do, hen night or just a party and you want simple affordable t-shirts? Try out our 1 colour budget packages. 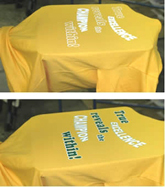 If you want to add more colours or have coloured t-shirts let us know and we will do our best to keep within your budget. If you are an Estate Agent that needs 'For Sale' / 'Sold' / 'To Let' boards or a Club Promoter or Retail Outlet that wants to advertise thought corex boards, we will be able to offer you an affordable solution to your needs. Contact us for a fast quote now.